The Canadian Clay & Glass Gallery established a close relationship with the late Carl Beam. 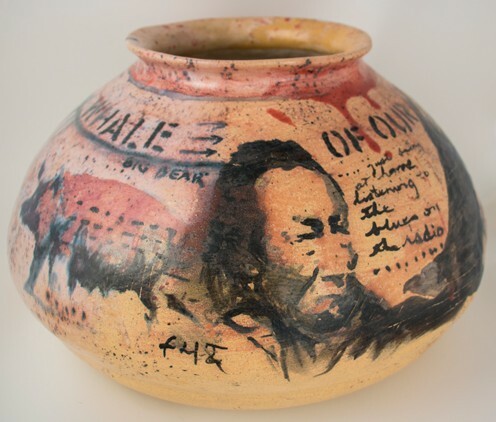 In 2004 gallery curator Virginia Eichorn organized It’s All Relative, a touring exhibition featuring 50 ceramic works by Beam, wife Ann and daughter Anong. Following the artist’s death in July 2005 from complications due to diabetes, the Waterloo gallery hosted a memorial service. I was honoured to be invited as a guest speaker. After she became director of the Tom Thomson Art Gallery in Owen Sound, Eichorn wrote It’s All Relative: The Ceramic Work of Carl Beam, an essay in Carl Beam: The Poetics of Being, the catalogue that accompanied a retrospective at the National Art Gallery of Canada in 2010. Eichorn’s husband Paul co-produced a documentary film, Aakideh: The Art & Legacy of Carl Beam, which premiered in Kitchener early in 2011. The ceramics gallery is continuing its connection with Beam through Tributaries: Midway ‘twixt earth and heaven, an exhibition curated by guest curator Patricia Deadman (a respected visual artist, independent curator and writer) and on view until June 26. 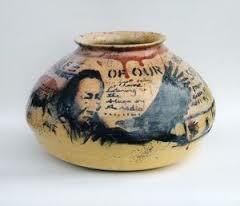 The exhibition’s theme is inspired by Beam’s Whale of Our Being, a clay pot from the gallery’s permanent collection. Six contemporary artists of First Nations ancestry, in addition to a family collective, interpret a shared history and culture through multi-media installation, photography, pottery and sculpture. The artists from across Canada include KC Adams, Rebecca and Kenny Baird, Nadia Myre, Marianne Nicolson, Greg Staats and Smith Family Pottery. 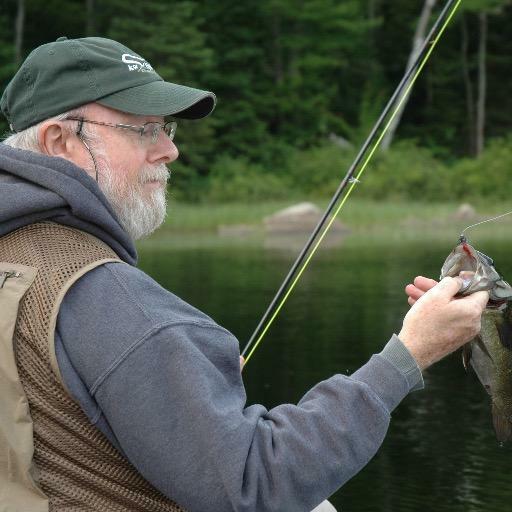 Before discussing Tributaries I would like to acknowledge Beam. I was introduced to his work in 1984 by Tom Hill, director of the Woodland Indian Cultural Centre in Brantford. Curated by Elizabeth McLuhan, Altered Egos: The Multimedia Work of Beam was a mind-boggling eye-opener. I had never seen anything like it from a Canadian indigenous artist. In addition to the review I wrote for the Brantford Expositor I wrote a review for the Toronto-based arts magazine ArtsPost (Issue 3, No. 1, 1985). After coming to Kitchener and covering arts for the then-called Kitchener-Waterloo Record, I wrote a review of a Beam exhibition at Renison University College at the University of Waterloo. In the summer of 2007 my family and I visited Beam’s studio/gallery on Manitoulin and enjoyed tea with Ann. I came to view Beam as a protean force of nature, a Trickster artist who was the hero of his own myth. With Robert Houle and Jane Ash Poitras and a small handful of other artists, Beam led what was then called ‘Native’ art out of museums of anthropology and natural history into galleries of fine art. His stance was the most determined and unapologetically defiant. Beam not only marched at the vanguard of First Nations artists who transcended the confines of historical and anthropological discourse, he was a seminal and important Canadian artist, bridging diverse heritages and cultures. Pillaging cross-cultural styles and techniques — from Rauschenberg, Johns and Warhol through the Anasazi pottery tradition of the American southwest — his oeuvre spanned mixed media painting, graphics, photography, printmaking, assemblage and ceramics. Combining text with painterly and digitized photo images, he filtered First Nations history and culture through the lens of mass-media, celebrity culture. 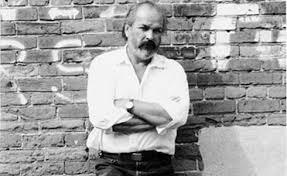 His work provided a crash course in the clashing world views of native and non-native histories/politics, psychologies/sociologies, cultures/ecologies, dreams/nightmares, mythologies/spiritualities. Now back to Tributaries which incorporates the natural elements of earth, fire and light to examine the foundations of indigenous thought and belief, especially as it concerns nature and ecology. Adams’ 2005 multimedia installation Cyborg Chicken Eggs (porcelain, lights, flour, sand, feathers) reminds us of the frailty and fragility of our fractured planet with illumined broken eggs amid white feathers scattered on the floor, against a sonic backdrop. I first met Brantford-based photographer Greg Staats two decades ago when I was the associate producer/writer/off-camera interviewer for Photograph: Beyond the Lens, a six-part TV program on Canadian photographers. 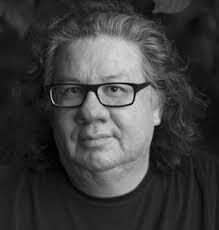 In my opinion he’s the premiere First Nations photographer in Canada. The eight toned silver prints here are part of his Animose series which examines ecological concerns by juxtaposing such natural objects as sticks, wood piles, stumps and plants in bleak mundane urban settings. Rebecca and Kenny Baird’s 1992 installation Talisman (graphite, white ash, cast glass eagle feathers, oil) consists of a bird’s nest containing water and a golden egg on the floor and a large fractured “Indian’ head ceramic coin (resembling the American penny) on the wall. The coin has a pair of glass eagle feather earrings dangling from each side. Adams’ 2015 installation Ghost Pots assembles on the floor a white porcelain bowl placed on a circle of stones with a water pitcher, surrounded by a large grouping of small empty bowls. The installation reminds us of the preciousness and precariousness of water, a natural resource and sustainer of life that is not limitless. Nadia Myre’s four digital prints — Political, Temporal, Material, Spiritual — are from her 2012 Meditations on Black Lake series. The mandala of small blue, black and grey precious stones constitutes variations on a visual theme. The assortment of handmade porcelain Iroquois pottery built by Smith Family Pottery (Steve, Sara, Lelah, Santee, Elda, Dee, Sylvia & Oliver) includes various sizes and shapes of pots, bowls, vessels and sculpture. By turns representational, abstract and stylized, they feature a rich assortment of natural imagery including birds, flowers, animals, trees, fish and insects in addition to hunan figures.